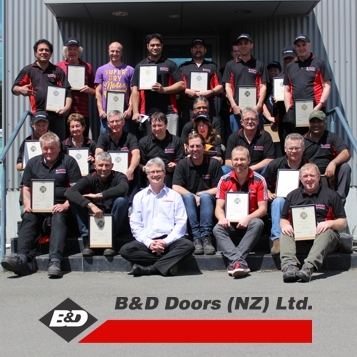 On Friday 7th November 2014 B&D Doors (NZ) Ltd. celebrated the culmination of two years’ work with a graduation ceremony for 23 Christchurch based employees. The ceremony acknowledged 12 of our manufacturing team earning a National Certificate in Core Skills (Manufacturing) and another 11 of the team (as well as this qualification) earning a National Certificate in Competitive Manufacturing (Level 2) at our Christchurch Head Office & manufacturing site in Hornby. 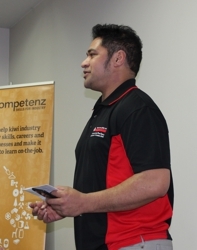 This has been a 27 month journey which started on the 5th of June 2012 when B&D Doors started “Project Commitment” which was not only the physical shifting of our Christchurch operation to a new site but also the commencement of members from our manufacturing team working towards gaining a nationally recognised qualification in manufacturing through the Hagley Adult Learning Centre and Competenz, the Industry Training Organisation (ITO) for the manufacturing industry. For the majority of the learners this is their first and only qualification as many left school at a young age. More importantly it is a meaningful and recognised qualification for the manufacturing industry. With an average employee age of 46 and most of the learners having not been in the education system for over 30 years the first 12 months of the course was targeted at improving numeracy and literacy skills to help with ensuring the success of this initiative. Both qualifications are based on the Lean Manufacturing Principals and covered the following common modules. For the National Certificate in Competitive Manufacturing (Level 2) the additional subjects were also passed. All of these subjects were taught and practically applied to their own work areas and teams with some outstanding outcomes. As a result of training, B&D Doors has seen huge personal & team progress including a significant improvement in communication skills, new processes developed to improve work areas, and increased employee confidence leading to more applications for promotions – and those applicants being successful! Joseph Maugaotega – Speaking about what the training meant to the employees.